This crochet blanket uses a unique approach to colors and shapes to create stunning effects. This hexagons are special. They look more sophisticated then squares. They have not only a 3D flower in the middle, but also in place of petals is a cable stitch which looks like interlocking petals. This Granny Cable Hexagon Blanket Free Crochet Pattern shows you how to crochet a wonderful eye-catching blanket. 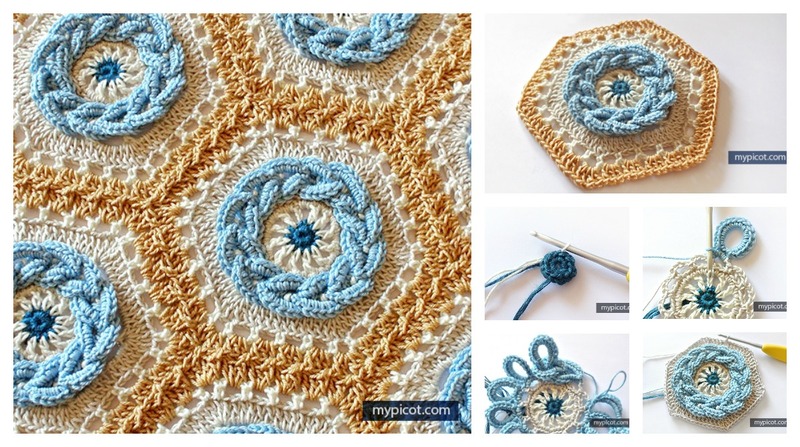 Crocheting individual hexagon crochet motifs is a great way to start if you haven’t done similar project before. The pattern also teaches you the join-as-you-go method to put the motifs together. You can choose to make only flowers as a decoration motif to your other projects.